Step Into a New Dimension--Virtual reality without the smartphone. The Damson AuraVisor is a revolutionary virtual reality head-mounted computer (HMC) that works without a computer or smartphone. Free from the clutter of wires and the hassle of connecting a smartphone, the AuraVisor has its own on-board Android-based computer that enables the immersive experience of virtual reality without breaking your budget. Content and Support. There is lots of free content available through the Google Play store. You can also stream that latest movie in real 3d or take an adventure through a 360 degrees world. Apps can be downloaded easy onto the AuraVisor by visiting the Google Play Store on a PC or Mac, simply login with the same account you logged in with on your AuraVisor, select a game/app you want to install and off you go. 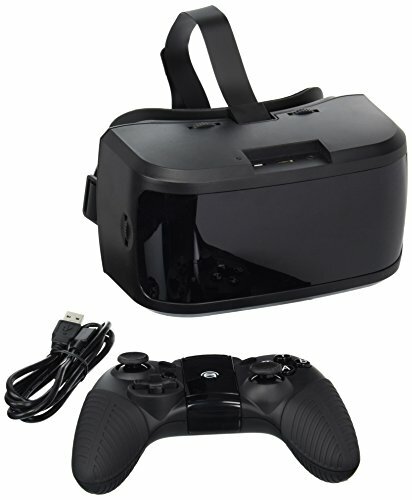 --For those of you that wish to be more adventurous, why not try downloading the RiftCat VRidge that allows you to play Oculus games. -- Damson provides full support through its Support Desk plus there is the user guide, which is being constantly updated to provided the user exactly what they need. --Intuitive Design that’s wire free--The AuraVisor was designed with easy and intuitive operation in mind and easily adjustable focus settings to ensure sharp vision even without glasses. Thanks to the additional game controller, the process of navigating and interacting in virtual reality is fun and simple! Damson’s mission was to create a virtual reality headset that could operate seamlessly and without any external devices or additional peripheral hardware. The AuraVisor is easy, quick and fun to use straight out of the box. Unlike other VR headsets, the AuraVisor does not require a separate PC to run the headset nor do you need to worry about using a smartphone or owning a specific model of phone This means you can experience virtual reality anywhere! If you have any questions about this product by Damson Audio, contact us by completing and submitting the form below. If you are looking for a specif part number, please include it with your message.